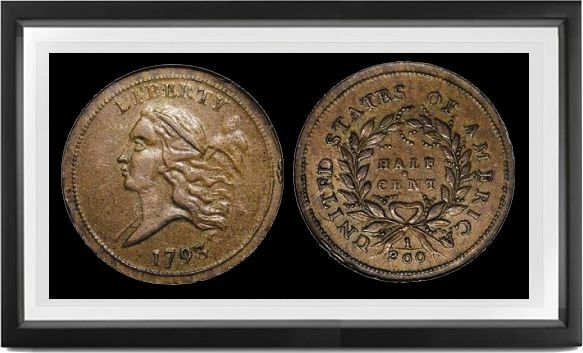 IN MANY WAYS the first type coin of the regular United States series, the 1793 half cent, is—as a design—unique. It is the first American coin ever to depict a Liberty cap, antedating the cents by four months. It is the only one known to have been designed and at least partly engraved by Adam Eckfeldt. It is the only one to have the head with cap and pole turned to left, in this was explicity acknowledging the design's ultimate prototype in Augustin Dupre's LIBERTAS AMERICANA medal (Betts 615, Lou-bat 4, AJN XXIII, 33), engraved in 1782, but familiar because some silver specimens had been presented to members of Congress in the ensuing years. It is the smallest and thickest of the half cents, and the only half cent prior to 1831 to have borders consisting entirely of round beads. It is the only half cent to have two leaves following DOLLAR on edge, a feature which connects it in time with the wreath cent Sheldon 11b.